GSLF said that it has taken up the responsibility to show the world that the majority of Sri Lankans reject the UN resolution on Sri Lanka, though it was endorsed by the government. The joint statement delivered at the 37th Session of the Human Rights Council on behalf of Macedonia, Montenegro, the United States, & the United Kingdom on Sri Lanka on 21 March 2018. , does not mention war crimes, that does not mean, however that the war crimes threat has gone away .it is probably hibernating. LTTE violated sacred norms of war. International law prohibits the killing of soldiers who surrender. (ICRC Rule 47) The LTTE executed 200 soldiers captured during Pooneryn army camp attack (1993). LTTE burnt alive hundreds of Sri Lankan soldiers who had surrendered during Mullaitivu army camp attack (1996). LTTE desecrated the bodies of soldiers killed at Kalmunai. (1990). Jeevan Base had four torture cells. A torture chamber was found at Puthumathalan. Boyagoda, who was held in captivity for a long time by the LTTE, said he had seen the torture chairs the LTTE locked their prisoners into before removing their fingernails. They saw other prisoners, who looked only half conscious, as if they had been tortured. I have heard screams from underground cells. . In one prison, we heard their cries, then the noise stopped, I think they were killed. LTTE violations regarding the safety of civilians in war zones have not received the attention they deserve. International Humanitarian Law prohibits the use of human shields and the taking of hostages (ICRC Rules 96, 97). LTTE used civilians as human shields in the battle at Dharmapuram. The children and families of women cadres were placed in the frontline in battles so that the state military could be charged with civilian murder. In 2009, LTTE spectacularly used 200,000 Tamils as hostages moving them from place to place. When these hostages ran away from the LTTE, LTTE fired on them with machine guns. The use of chemical weapons and poisons is prohibited in war (ICRC Rules 72, 73). LTTE used chemical weapons against Gemunu watch at Nachchikudah. Chlorine gas was used at Kiran and tear gas was fired from launchers at Akkarayan. The use of tear gas is prohibited under the Chemical Weapons Convention. Cans of poison gas were found buried in Puthukkudiyiruppu. Tippmann A-5 guns, capable of firing deadly chemicals were also found. The Convention on the Prohibition of Anti-Personnel Mines bans the use and stock piling of mines. LTTE heavily mined the approaches to their territory. More than 770,000 anti-personnel land mines have been recovered so far. Mine attacks killed and maimed many armed services personnel. ‘We amputated a lot of legs.’ said the surgeons. LTTE devised a mine which damaged a soldier’s leg in such a way that a prosthetic could not be fitted to it. Mine manufacturing factories were found in Mullativu. Mines were stockpiled. A cache of 1093 mines emerged at Govipal Aru area, Ampara. Another cache had 18,000–20,000 mines. Article 51(2) of Additional Protocol I prohibits acts of violence intended to create terror among the civilian population”. LTTE ignored this. There were ambushes and killings. Twenty-five civilians who were traveling in a lorry from Negombo at Kokuvil were ambushed by LTTE cadres, who killed 14 of them. LTTE used bombs to create terror. Bombs were placed on roads, buses, trains, in post offices, railway stations, once in a department store. Bomb explosions in the south were in predominantly Sinhala populated areas. Tamil populated areas such as Kotahena, in Colombo, were not bombed. LTTE bombed Central Bank building, killing more than 100 and wounding about 1,400. Four simultaneous bombs exploded in Colombo-Alutgama train resulting in 64 deaths and 400 wounded. A bus carrying 140 civilians in Kebithigollewa was bombed. A powerful Claymore-type roadside bomb, packed with explosives and ball-bearings hit a passenger bus at Buttala, killing 27 civilians and wounding 67 others. Passengers who ran out of the bus were shot. Suicide bombing is universally considered a crime. LTTE used suicide bombers to attack vital locations (Katunayake), installations, (Kolonnawa), institutions (Central Bank) and public places where crowds gathered. These persons exploded themselves on roads, buses, trains and at public functions. They rammed into their targets using truck, jeep, motorcycle and once even by rickshaw. There were suicide divers as well using underwater scooters, fishing boats and stealth craft. These ‘Black Tigers’ were glorified as’ ‘highly motivated, well trained, able to get at heavily guarded targets’. But military specialists point out that the suicide bomber is a tool, not a hero. He is given sleep inducing drugs, and then trained to obey a handler and respond to trigger words. The handler activates the bomber at the right time. There are ‘protected’ places which cannot be attacked in war. Additional Protocol 1 (1977) prohibits attacks on installations and vital institutions. LTTE bombed Central Telegraph office, attacked Kelanitissa power station , Kolonnawa, Orugodawatte oil storages, gas storage, Muthurajawela. Placed of religious worship are also protected sites. Attacks on them are considered criminal acts (ICRC Rule 38, 40, Hague Convention 1999). LTTE did not target churches, kovils or mosques, only Buddhist sites. A truck with explosives was sent into the Dalada Maligawa. Samudragiri vihara, Illankathurai was destroyed. Stupas at Verugal, Kalladi and Toppur were used as communication towers. It appears, also that heavy weapons were installed at Thoppigala. Kumbakaranamale Chaitya, Ampakaman, was used as a food store and Wedivetttukallu Chaitya was used as a bunker. There are ‘protected persons’ as well, whom soldiers are forbidden to kill (Geneva Convention IV). They include Buddhist monks. LTTE targeted Buddhist monks. Kitulagama Seelalankara Nayaka Thera of the Dimbulagala Forest monastery was assassinated in 1995. In 1987 armed LTTE cadres ambushed a bus taking Buddhist monks on a pilgrimage, ordered the bus to Arantalawa jungle, and killed the chief priest and all 30 samanera monks in a brutal manner, using swords, guns and machine guns. One monk was permanently disabled. LTTE also targeted worshippers in Buddhist temples. In 1985, LTTE entered Anuradhapura main bus station and opened fire with automatic weapons, killing and wounding civilians who were waiting for buses. The LTTE cadres then drove to the Sri Maha Bodhi and gunned down worshippers, killing 146 persons including children. 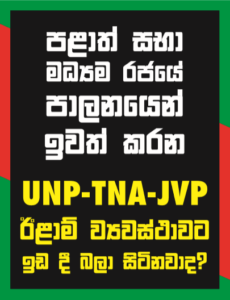 Somawathi vihara was attacked twice. The second shooting was done to discourage pilgrims coming to the temple on Esala Poya. A bomb killed 23 and injured 70 at a Buddhist temple in Batticaloa during Vesak in 2000. The bomb that exploded in an Anuradhapura-Kandy private bus at Dambulla (2008) was to be exploded at Ruwanveliseya when a ‘pichchamal pujawa’ was in progress with thousands of devotees taking part in the ceremony. The informant who had carried the bomb had been accompanied by her mother and sister, all posing as Buddhist devotees going on pilgrimage. LTTE attacked over 75 unprotected Sinhala villages in Anuradhapura, Polonnaruwa, Vavuniya, Trincomalee, Batticaloa and Ampara districts. The main target was Sinhala villages in Trincomalee district. Villagers took to sleeping in the surrounding jungle during the night for safety. Some villages were attacked more than once. Arantalawa, Mahadiulwewa, Namalwatte and Serunuwara were attacked twice. Wadigawewa thrice, Morawewa four times. Many of those killed were women and children. Pregnant mothers were specially targeted. LTTE killed in a brutal manner. There were massacres in the Sinhala villages of Morawewa, Gomarankandawela, Kantale, Ganthalawa and Seruwila (late 1980s). In 2009 ten civilians including children were killed at Rathmalgaha Ella near Rathugala in Inginiyagala and 21 Sinhala villagers at Kirimetiyaya on the Bibile-Ampara road. At Kithulutuwa 127 men, women and children were slaughtered. At a press conference to discuss the film ‘Gamani,’ a speaker who had lived in the threatened villages said that the situation was far worse than what had been shown in the film. The film shows only little of what actually happened.